Scotland's latest professional women's rugby players want to see an entire squad of full-time athletes. Chloe Rollie and Lisa Thomson become just the second and third Scottish players to earn full-time contracts. They follow back-row Jade Konkel in moving to the French top tier, where they will play for Lille Metropole Rugby Club Villeneuvois. "Everyone wants that to happen and everyone deserves it as well," Rollie, 22, told BBC Scotland. The Scottish duo have signed initial one-year deals with Scottish Rugby's partner club, LMRCV, who won the French Top 8 in 2016 and finished runners-up a year later. Murrayfield Wanderers full-back Rollie, who has 17 caps, says the move will allow the Scots to experience a standard they cannot obtain on a weekly basis at home. "It'll be amazing to develop us as players," she said. "We get challenged here, but I don't think it'll be anywhere near what we'll get over there." Edinburgh University centre Thomson, 19, has earned 12 caps, scoring a try in Scotland's Six Nations triumph over Wales in February - their first win in the tournament since 2010. "It'll be good just to get competitive games there week in, week out," Thomson said. "It's the top league in France. They've got four, five French internationals who are competing at the Women's Rugby World Cup at the moment." Scottish Rugby will pay the players' contracts, and has stipulated they are to undergo French lessons, while the Villeneuve-d'Asq-based club will provide their accommodation, medical care and travel. The trio will be available for all Scotland training sessions, camps and international fixtures. Stephen Gemmell, Scottish Rugby's head of academy and performance programmes, admits the women's game in Scotland cannot presently support their development. But he believes there is scope - and money - for other female players to become professional. "The players have demonstrated ability, application and the behaviours we would want in professional athletes and have been contracted as a result," Gemmell said. "We then need to look at what environment do we put three professional players in. And, unfortunately at the moment, the environment we've got in Scotland doesn't push them week in, week out, to the required standard. "The barrier here is not financial. If the initiatives are right and proper for the game in Scotland, resources will be found to do it." Gemmell says increasing the number of girl and women players is vital in order to provide opportunities on home soil in future. 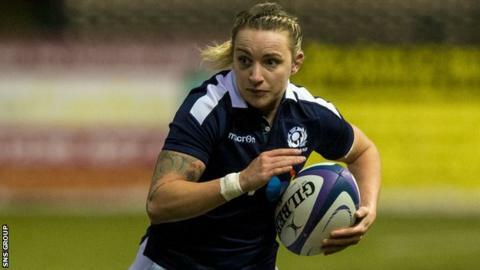 "The sacrifices required to reach the top of the female game in Scotland are massive," the former Scotland Sevens head coach said. "Our challenge is to improve the standard of our national team and pathway into that national team and improve the standard of our domestic game. "The only way we can do that is by increasing the numbers that play. "Unfortunately, if you look at our domestic game at the moment, it's not competitive every week. "Until you get a mass of quality players that ensure you get that consistent level of competition, you have to be innovative and look at other solutions. "In the long-term, would we want it to be in Scotland? Absolutely, but that is going to take time."